NewspaperSubscriptions.ca is a safe, secure, online newspaper subscription service. We provide consumers with the best deals and low prices on newspaper delivery from a wide variety of titles. If you would like to start a subscription to your local newspaper or just research newspaper delivery rates, please visit our subscription home page and enter your postal code. 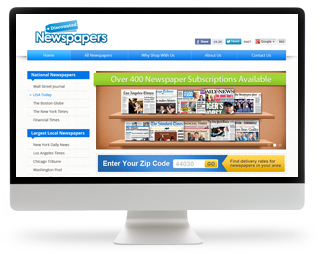 Founded in 2001, Newspaper Subscriptions is the leading online subscription service for local and national newspapers on the web. We have a direct relationship with every newspaper that we offer. This ensures you of prompt, reliable service and great prices. Our checkout is quick and easy, and your newspaper delivery will begin within a week of your order. Your order information is kept safe, and we value your privacy. We would love a chance to earn your business and to add you to our growing list of customers. We are always eager to hear from our customers. Please let us know how we can help you. When contacting us about a subscription or promotional offer that you have seen or ordered on our website, please include your name, address, the newspaper you have ordered and, if available, the order number. Please send your questions to our Contact page. We look forward to hearing from you.